Schweiss is the go-to door professional. 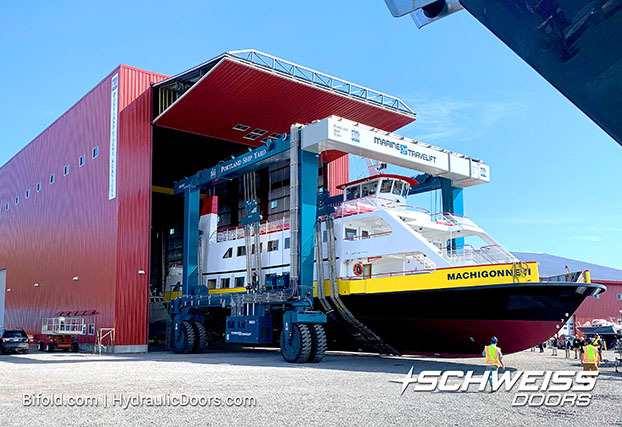 We manufacture and install low maintenance custom one piece hydraulic doors that lift up and out to form a canopy when open, and patented Bifold Liftstrap / Autolatch doors, both of which are distributed internationally. Architects love our eye-appealing designer door line which includes custom made glass doors that are featured in many fine restaurants, hotels and commercial retail establishments throughout the United States. Many of these attractive, but functional doors, are designed to open an entire wall within an establishment and blend into the interior or exterior without you knowing there is actually a door or moving wall there. With clean aesthetics, simple installation and smooth, quiet operation, our strong steel or aluminum frame architectural engineered designer doors accept most cladding systems; glass, polycarbonate, wood, steel, etc. 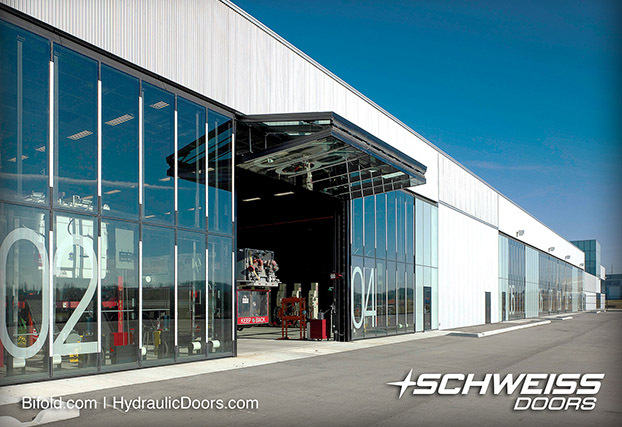 and Schweiss hydraulic and electrical operated bifold doors come with many safety features and upgrade equipment. 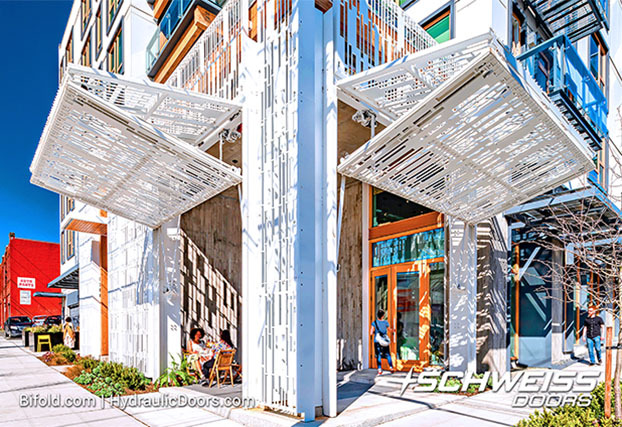 Schweiss Doors' goal is to meet or exceed your expectations and we keep you involved in the process every step of the of way with personalized service tailored to your architectural or engineering needs. If you can dream it, we can design and build your door exactly the way you want it. 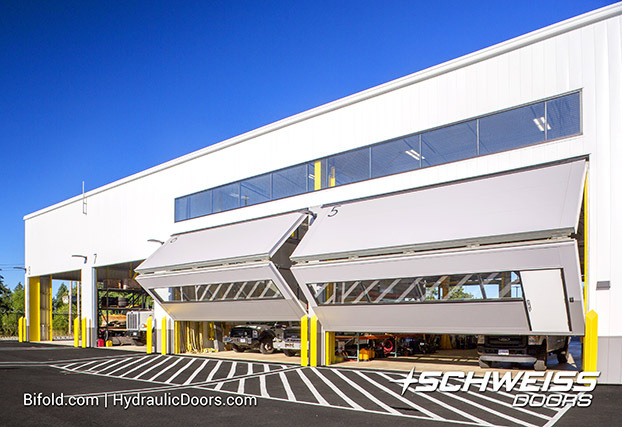 Finding the right custom door for any application, residential, retail, offices, schools, restaurants, garage, commercial, industrial, military, hangars and more is as close as your telephone by dialing 800.746.8273 or by visiting www.schweissdoors.com. Please contact Schweiss directly for distribution information. This Schweiss 40ft. Liftstrap Bifold glass door made the Red Bull Headquarters skateboard ramp a focal point of its Santa Monica, California headquarters building. 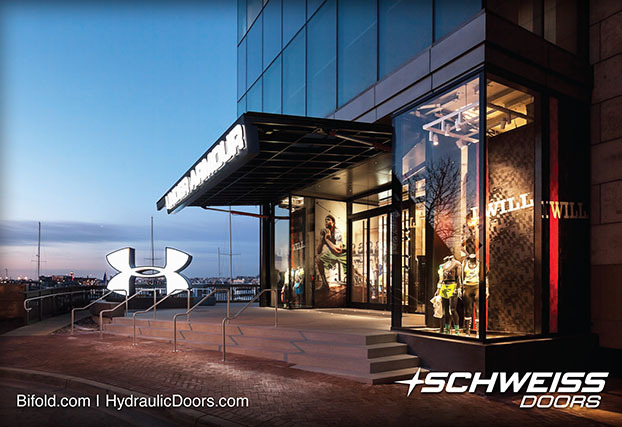 Top of the line 29' x 12' Schweiss Hydraulic Designer Door graces this Under Armour storefront and corporate offices in Baltimore, Maryland. 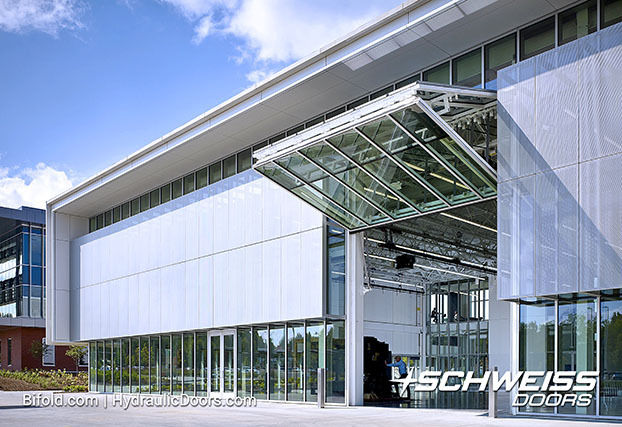 The city of Newmarket, Ontario, Canada placed 20 glass 19’x21’ bifold liftstrap designer doors on its new $20.2 million Operations Centre. Large etched numbers identify each door. Schweiss Doors supplied 11 Lift-Strap custom-made Bifold Doors and one Hydraulic Door for the Opus One Napa Valley Winery in Oakville, California. SilverWing Airpark at Sandpoint, Idaho ordered two 45’x15’ bifold designer doors for its model residence hangars at its fly-in residence community. The Institute of Contemporary Art (ICA) in Boston got some very unique designer doors. The doors are each 15.9’ wide by 19’ tall. The top half of the doors overlaps the bottom half when partially opened. 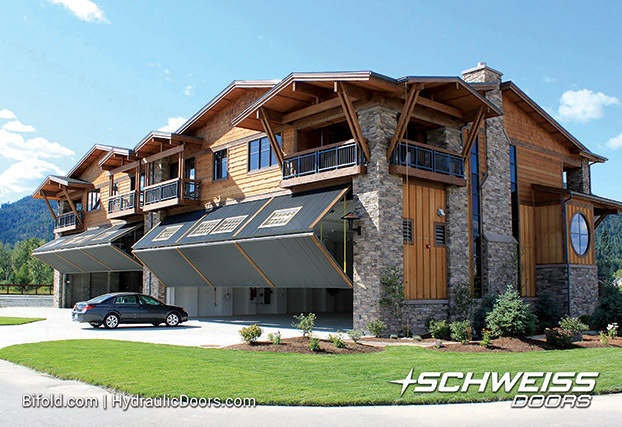 This residential ski lodge at Kicking Horse Mountain in British Columbia installed a 20’x8’ hydraulic garage door. 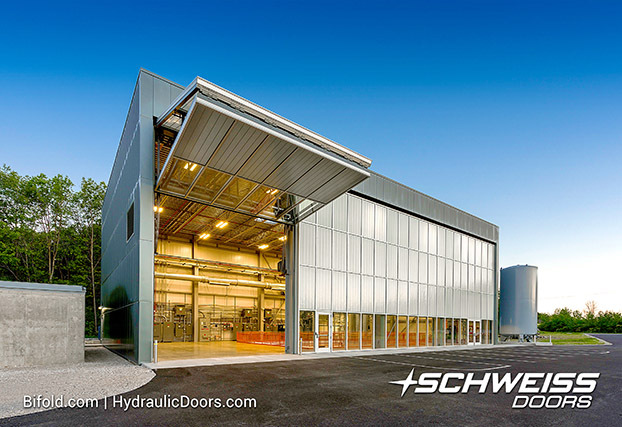 Thousands of Schweiss Doors have now been installed across North America, Europe and Asia. This door on a Beverly Avenue home in Santa Monica covers two stories and opens up for a view of the ocean between closely located trees in its backyard. Schweiss Doors was delighted to take on a project no other door company would consider. The new Sacramento Kings Stadium “Golden 1 Center” has five specially engineered 29’ x 41’ liftstrap doors. The front of Dennis Yates 40x60 ft. revamped wood hangar in North Carolina has a 39 ft. x 11 ft. hydraulic door. 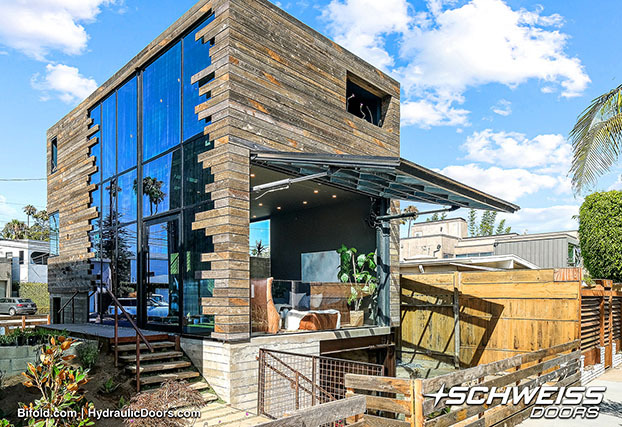 This awe-inspiring Los Altos, CA luxury home features a Schweiss 36’ x 23’ tall glass hydraulic curtain wall door. The entire façade of the home can be opened like an aircraft hangar door. 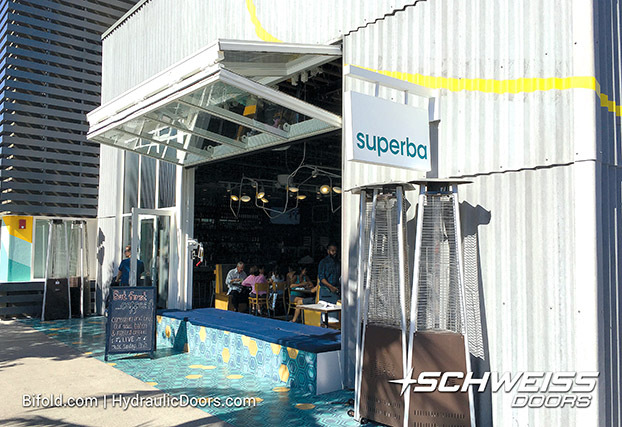 Superba decided on a custom-made 14’ x 10’ glass-clad bifold liftstrap door. When they open for business at 7 a.m. they also open their Schweiss glass bifold door to welcome diners in from the sidewalk. The Fermi National Accelerator Laboratory (Fermilab) in Batavia, Illinois recently completed a $8.3 million building expansion that included a 21’ x 24’ Schweiss bifold liftstrap door. 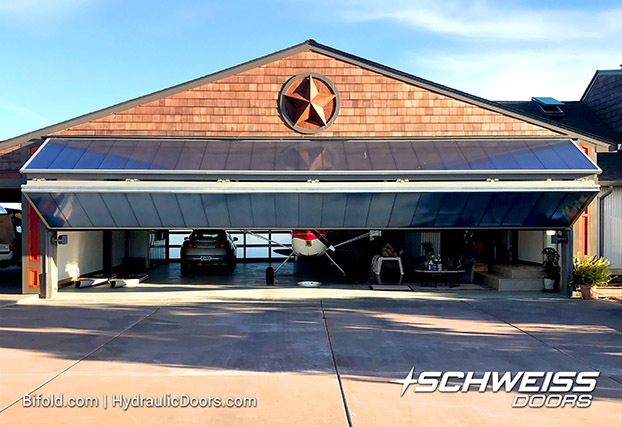 Unique looking hangar door in North Plains, Oregon, is clad with a special light weight blue polycarbonate cladding that allows light to shine through and brighten up the interior. 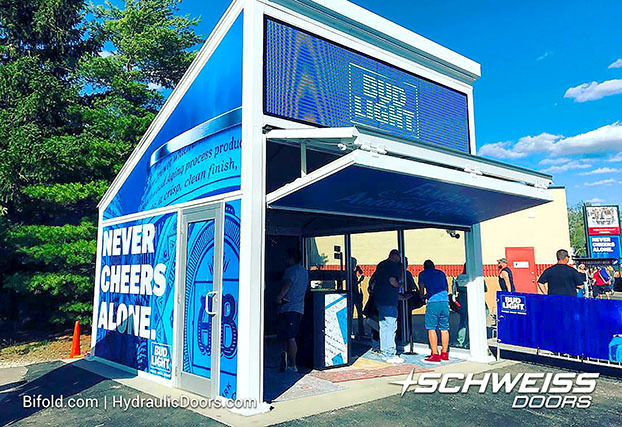 A total of 13 concession stands were outfitted with Schweiss lift-strap bifold doors to be used at amphitheaters in LA and all over the US. 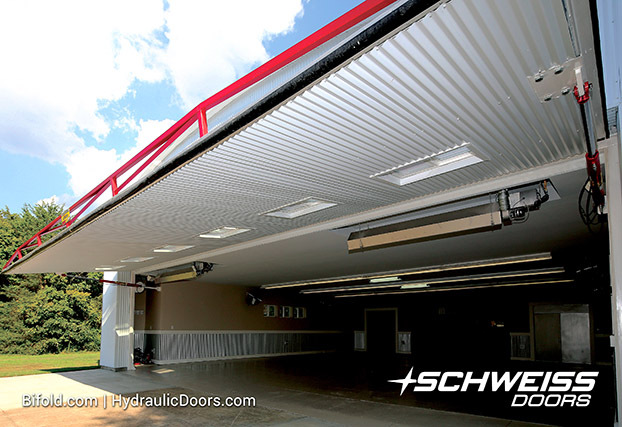 The brand spankin' new Texas Music Factory in Irving, Texas did more than just open their doors — they opened seven Schweiss 36' bifold liftstrap doors at their music pavilion. 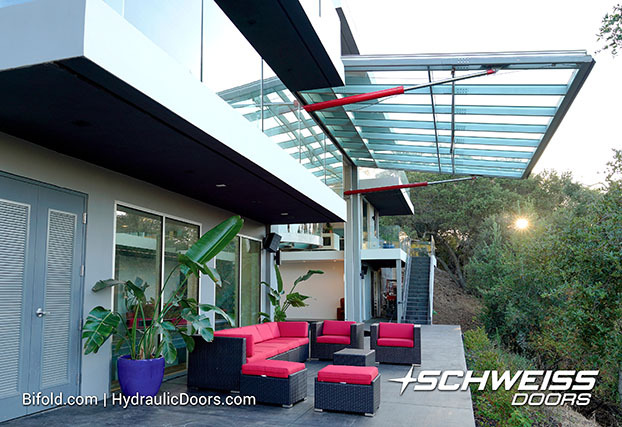 Schweiss Bifold Doors, Patented Liftstraps & Autolatches. 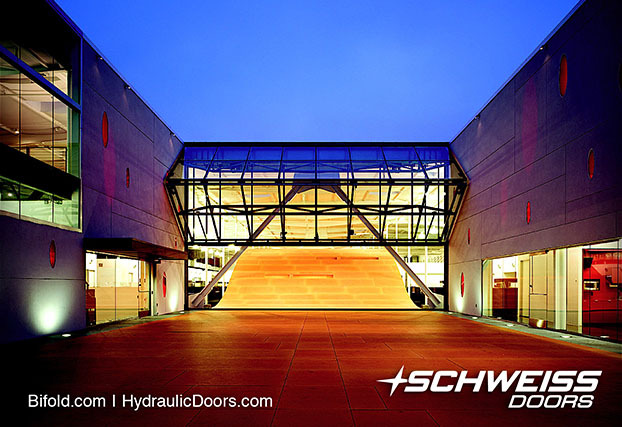 Schweiss One-Piece Hydraulic Doors. Schweiss Designer Doors. New and Improved Hydraulic Pump. Spherical Bearings. Beefed Up Hinges. Stronger Cylinders. Three Backup Systems. Liftstrap Conversion Kits. Free Standing Headers. Agricultural, Post Frames. Hangar and Hangar Home Doors. Sound Control Doors. Sandblast Doors. Crane Doors. Container Doors. Medical and Pharmaceutical Doors. Corrosion Resistant Doors. Residential and Garage Doors. Cold Storage Doors. Blast Doors. Moving Wall Doors. Designer Doors. Remote Control Systems and more. 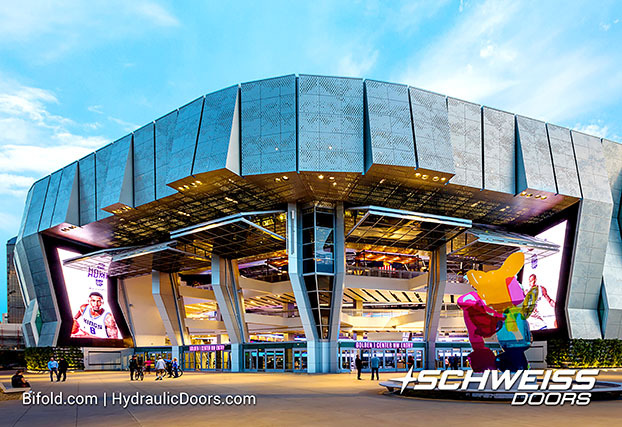 Schweiss Doors has contributed to the new Sacramento Kings Arena, the first Indoor arena to achieve LEED platinum designation, and a NewMarket Ontario municipal building, one of the first Canadian municipal buildings to achieve LEED silver designation.